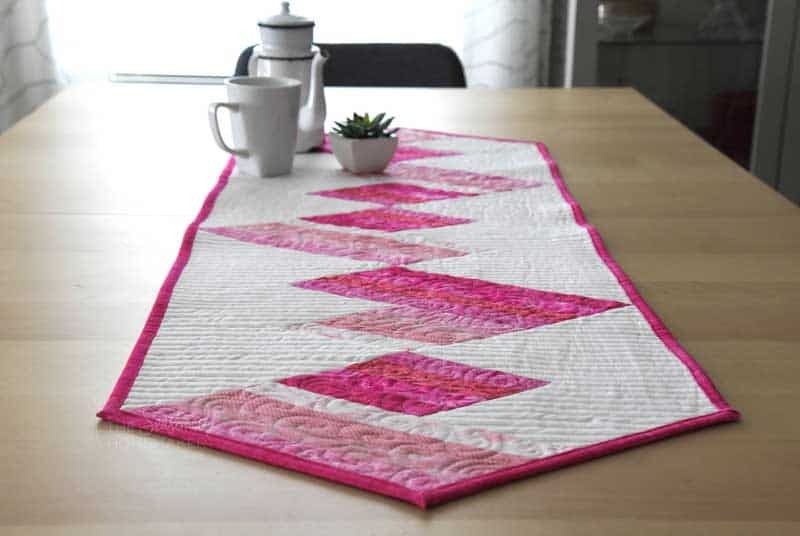 Today, quilt pattern designer and teacher Krista Moser is sharing a sweet Valentine’s Day Table Runner Tutorial. 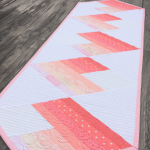 With one versatile ruler this pattern goes together quickly and easily converts into a baby quilt! 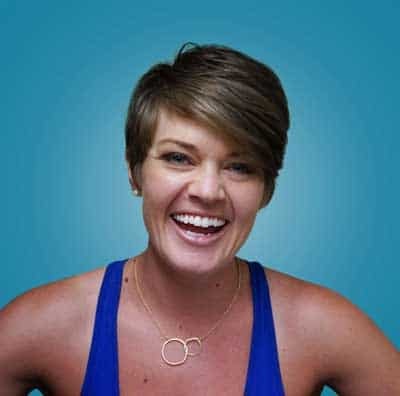 Learn more about Krista and her awesome ruler at the end of the post. I’m sharing a recent project with you just in time for Valentine’s day! 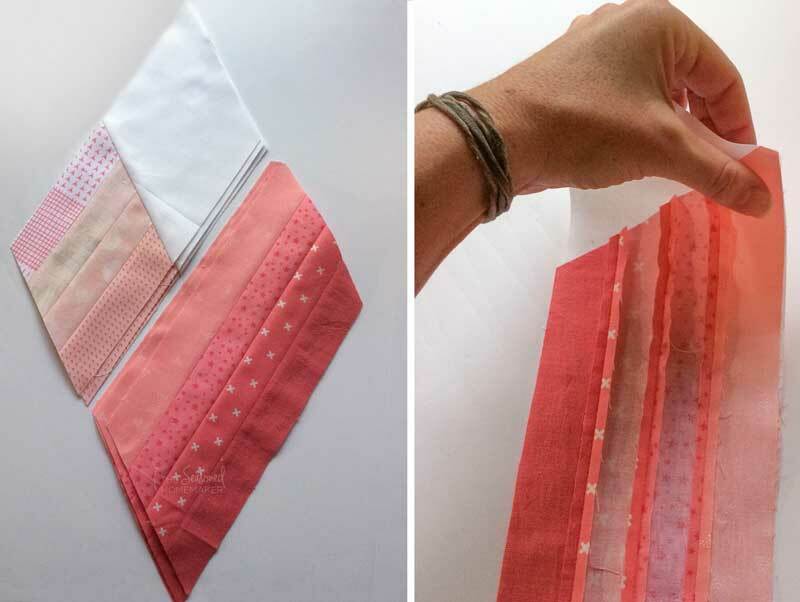 It’s a table runner that goes together quickly using fabric strips. The secret is a 60-degree Diamond Ruler. 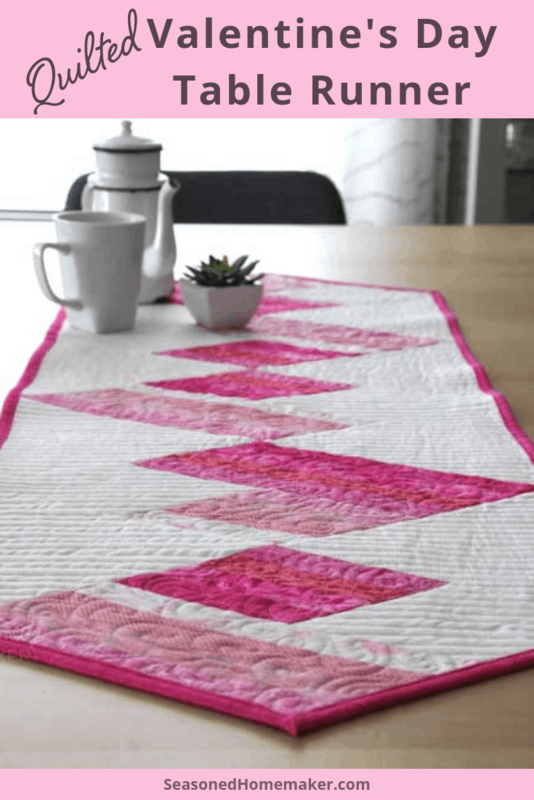 This little heart table runner will show you some of the cuts the Creative Grids 60-degree Diamond Ruler can do as well as a few other piecing tricks that’ll make your quilting adventures a raging success. You will be amazed at how quickly this project goes together. One of the things I love to do is work with a simple color pallet. 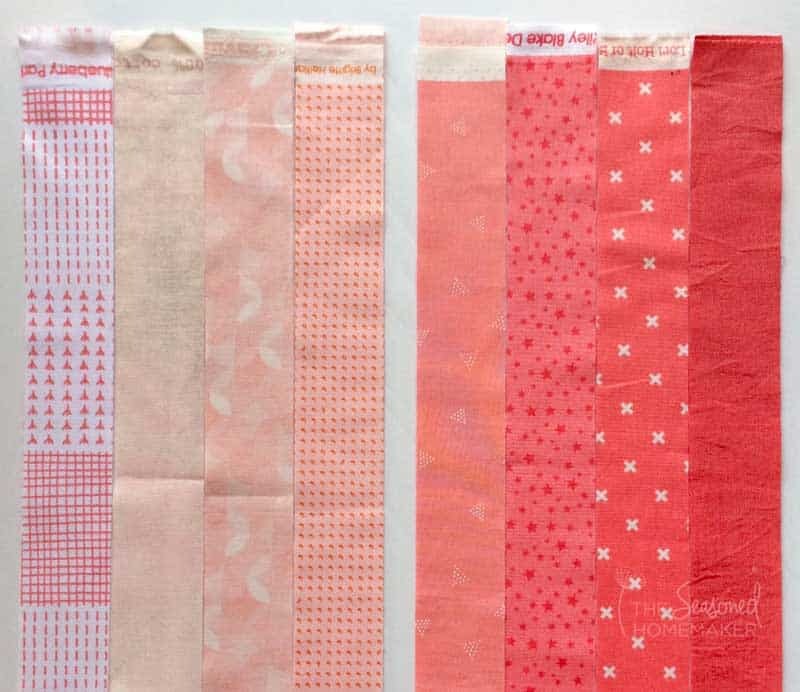 Here I chose eight different shades of coral pink from light to dark; this keeps things visually interesting while not feeling cluttered. I cut a 1.5” strip (x width of fabric) from each one and sewed them together into two sets, the lightest four shades in one and the darker four shades in the other. If you want a thorough tutorial on accurate cutting click here. This is a good time to check your seam allowances. 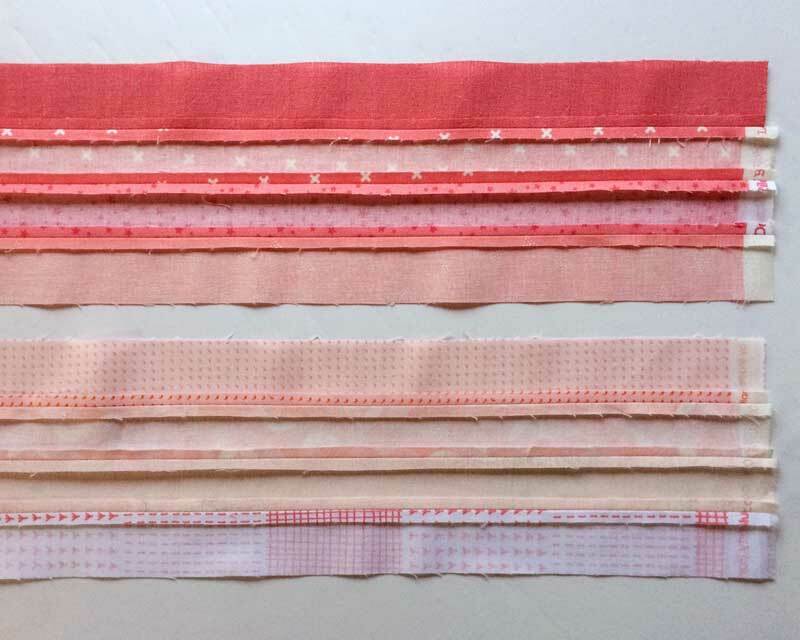 These sets of four strips should measure 4.5” across, once sewn. If they don’t, then adjustments are needed. If you sew the first two strips together and press the seams out, that pair of strips should measure 2.5”. 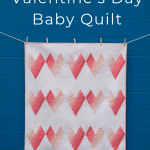 Catching this early will save a lot of piecing frustration no matter what quilt you are making! 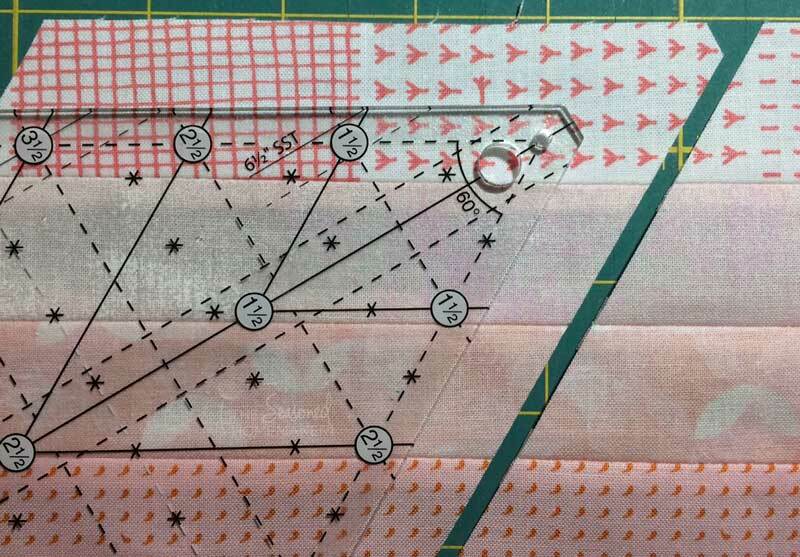 Here is a good tutorial on the perfect ¼” seam. I tend to press my seams open. 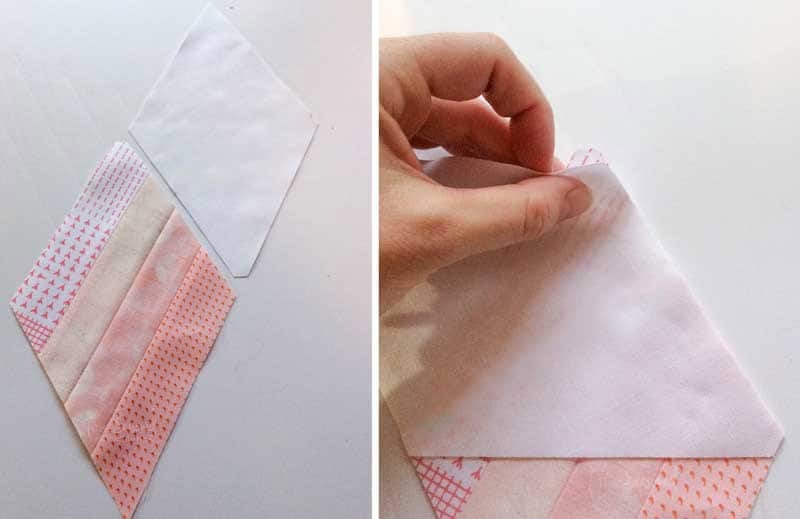 You can, of course, press towards the dark side, but I have had great success with flatter piecing and less bulky seams by pressing them open. The key is lowering your stitch length to 2mm or 12 stitches per inch. Now for the magic! 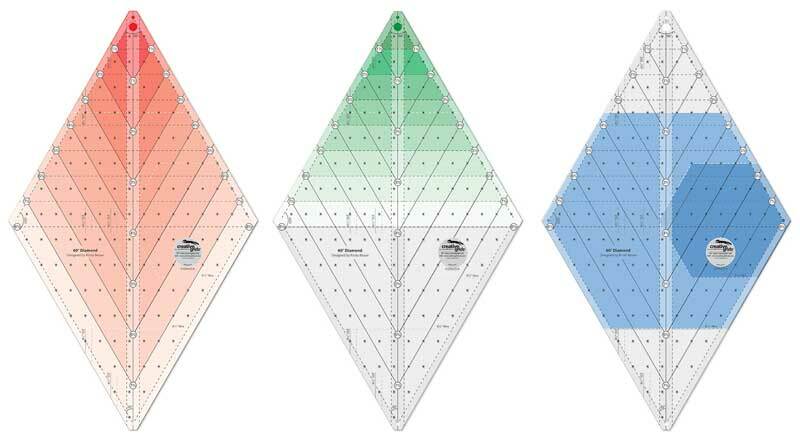 The Creative Grids 60 Degree Diamond Ruler is marked for diamonds from sizes 1.5” – 8.5”. It also has triangle markings on one half for the same size range as well as hexagons, trapezoids and parallelograms. Because of its versatility you can cut just about any shape with this ruler! 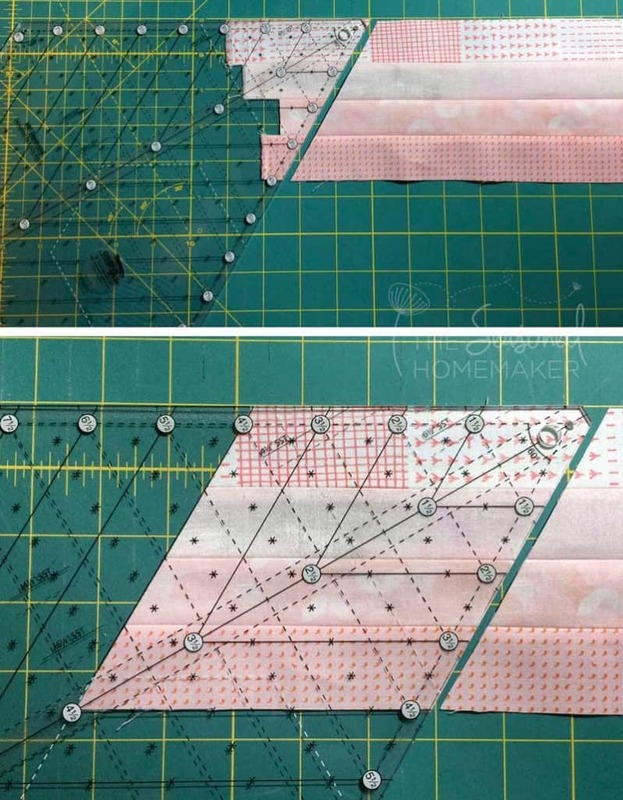 Begin with the lighter fabric set and use the end of the ruler to trim off the edge of the strip set at the 60-degree angle, then move the ruler down the strip so the fresh cut end nestles into the 4.5” diamond lines. Make three diamond cuts like this. Notice how the point of the ruler is flat. 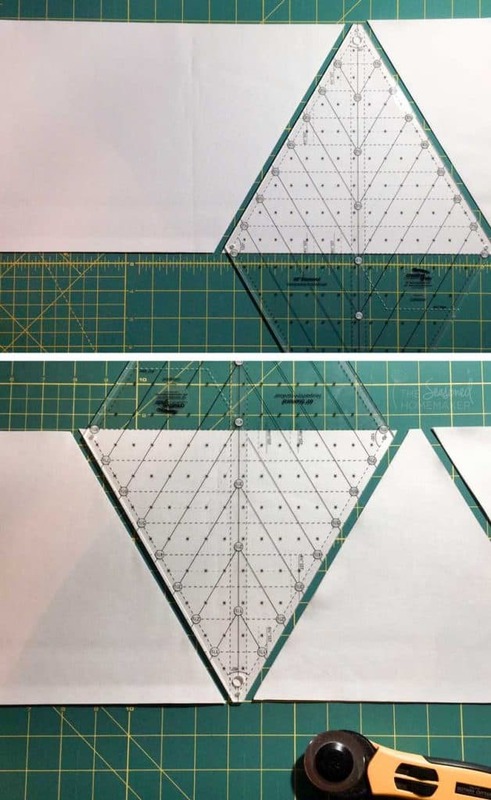 By trimming that little point off, with the ruler, piecing the next step will be a breeze! For the next cut, place the full width of the ruler on the strip. This will be an 8.5” parallelogram. Be sure the top edge of the ruler and strip match and the bottom edge of the strip lines up with the 4.5” line. Make two cuts like this. Repeat this process with the darker strip set, only this time you will need two diamond cuts and three parallelogram cuts. Now for the background. From a 4.5” strip of white, cut five 4.5” diamonds just as before. Trim the end off the strip at the 60-degree angle, then move the ruler down the strip cutting diamonds. Make two sets of heart blocks: three with the darker color as the parallelogram and the lighter diamond, and two of the reverse version. Sew the pieced diamond and the background diamond together. Here is where that trimmed off tip comes in handy, because the tips have been removed there is no guesswork on where the seam allowance should be and no dog ears to remove. Once this piece is pressed open, the edges will be perfectly in line. Next, sew the parallelogram piece to the diamond unit. The same flat tip trick applies here. Press these seams out. You should have five full heart blocks: three that are mostly dark and two that are mostly light. Cut 2 8.5” x WOF strips of the white background. 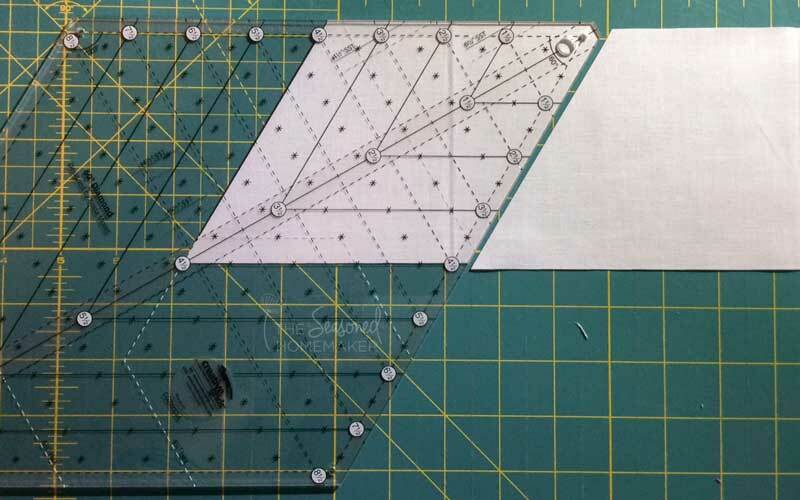 Using the triangle lines on the ruler, cut eight 8.5” triangles. Make the first cut, then rotate the ruler 180-degrees to make the second cut. I arranged the hearts in alternating directions with the darker ones going one way and the lighter ones going the other way. It makes no difference for final assembly because they are equilateral diamonds after all! Once your quilt top is assembled all that’s left to do is quilt and bind. Now for the fun part. 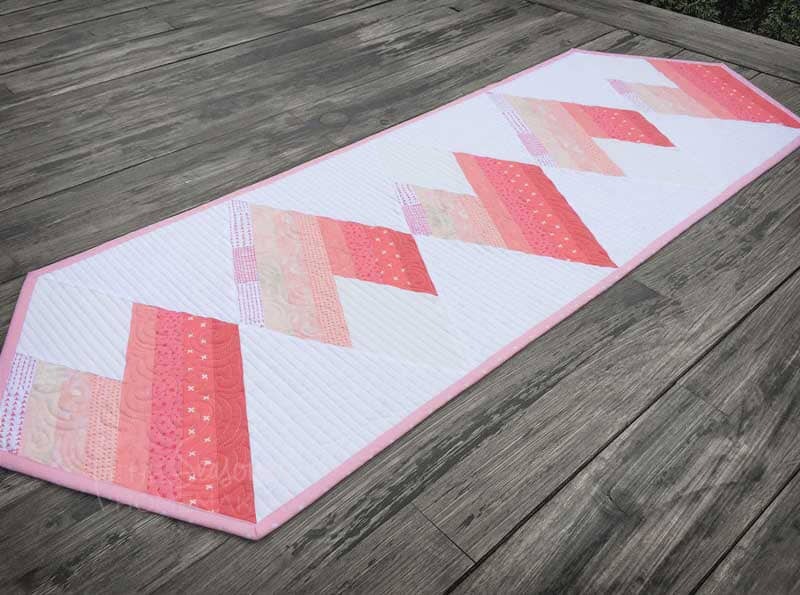 Make two more rows and this easy table runner can become the most adorable baby quilt! 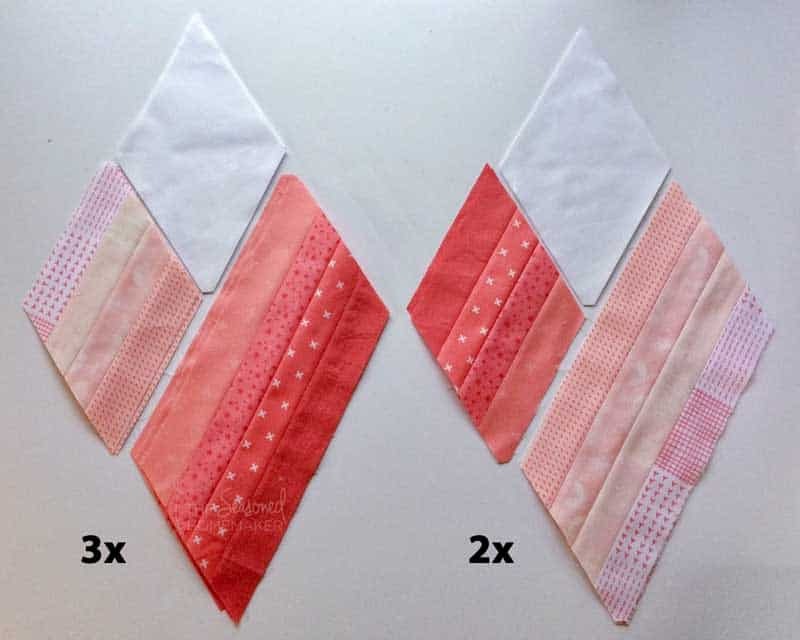 If you would like one of these rulers, I will be including the full instructions for this table runner PLUS the final assembly diagram PLUS the baby quilt cutting instructions with any ruler purchase. 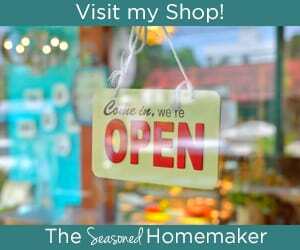 Here is a link to my webshop, just use coupon code “HEARTS” when you checkout. Well, there you have it. Aren’t these adorable and really not hard at all! I hope you found something helpful or inspiring here. 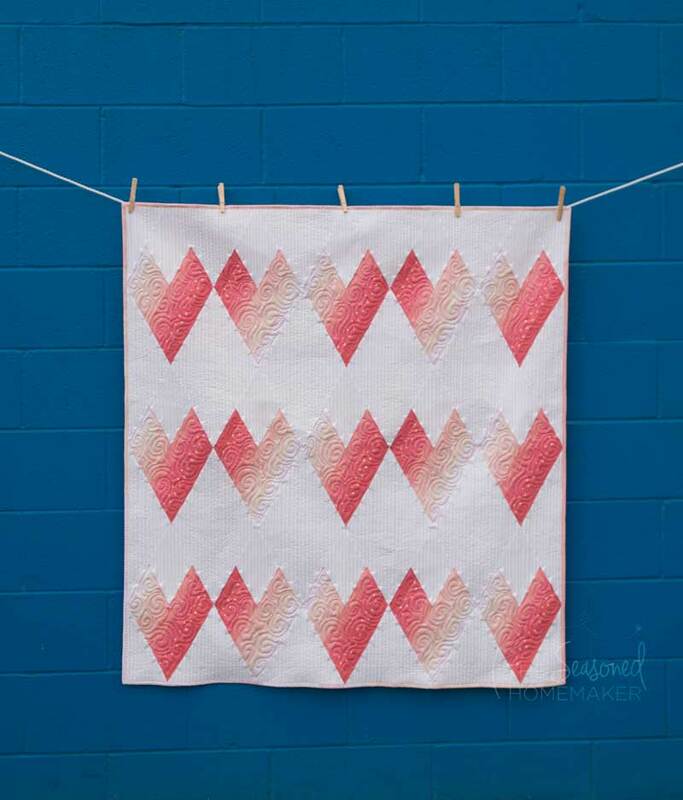 Meet Krista Moser, a quilt pattern designer and teacher of all things quilting. For more than twenty years Krista has been sharing her passion for quilting. 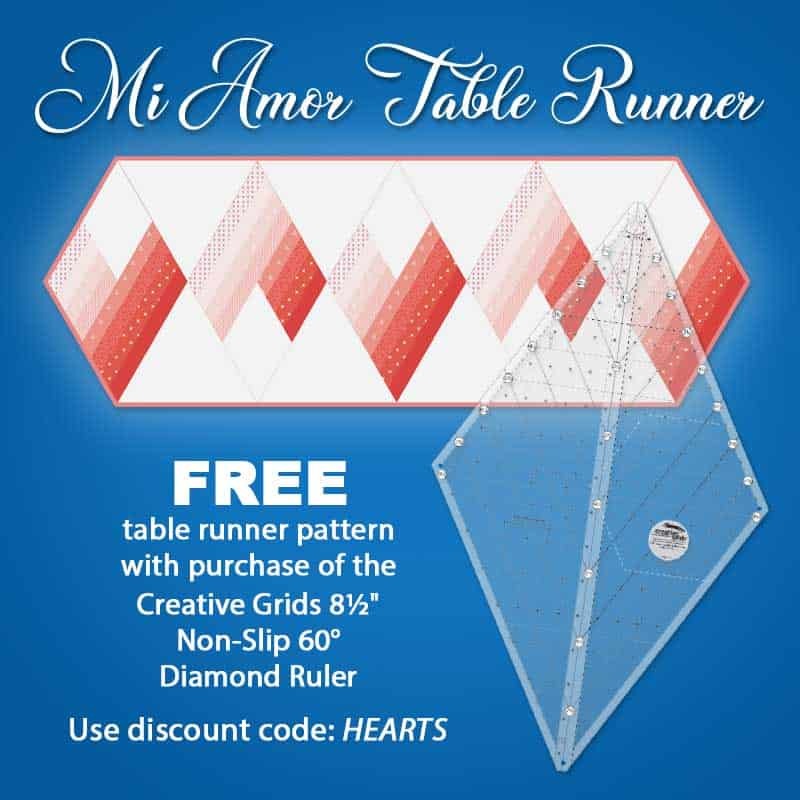 She is the designer of the Creative Grids 60 Degree Diamond Ruler and has created a whole lot of patterns to go with it. You will be amazed at how simple this tool is to use! 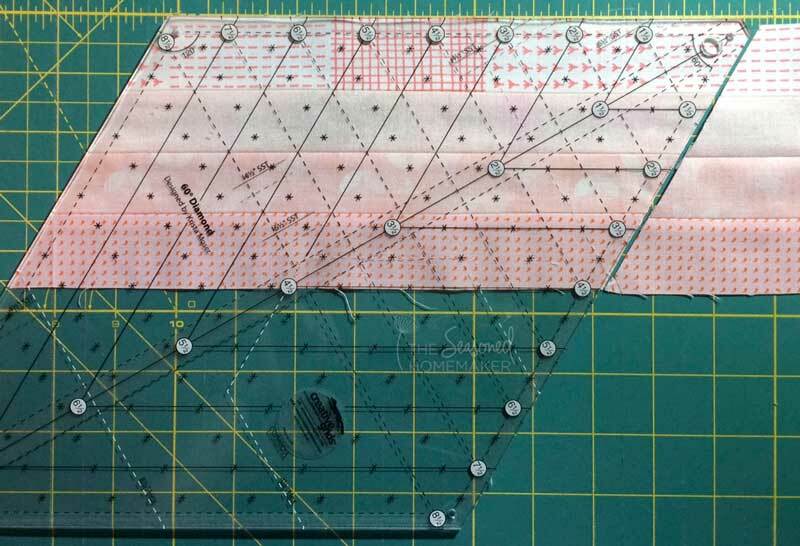 Check out Krista’s other patterns and see all of the ways you can use this amazing ruler. Here is a link to the webshop, just use the coupon code “HEARTS” when you checkout. If you’d like Krista to teach at your local quilt shop, you can reach her at [email protected]. What great instructions, even for a beginner. I have been doing machine embroidery, up until now. 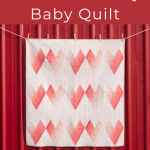 I am going to try making a quilt, and have been looking at blogs, and will sign up for a class at our local fabric/machine store. Your instructions are sequential with excellent example pictures. Great job! could you just do this as a square instead- the hearts would be wider, but it seems for a beginner sewer it would be a lot easier! Yes!!!! 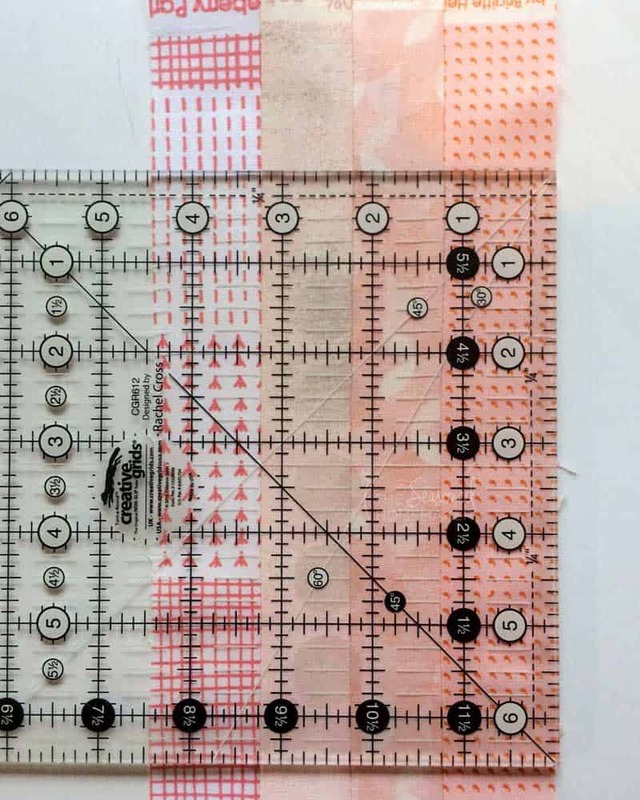 The FREE pattern that comes with the ruler has directions for squaring off the ends. Thank you. I agree with the above comments. I have never quilted, but your directions are very clear and so easy to understand that it just might be possible for me to do so. I love to read craft stuff, but often the directions seem to be written specifically for those very familiar with the art. Again, thanks, because I do enjoy sewing. This is so cheerful, thank you! I will be making this over the winter.